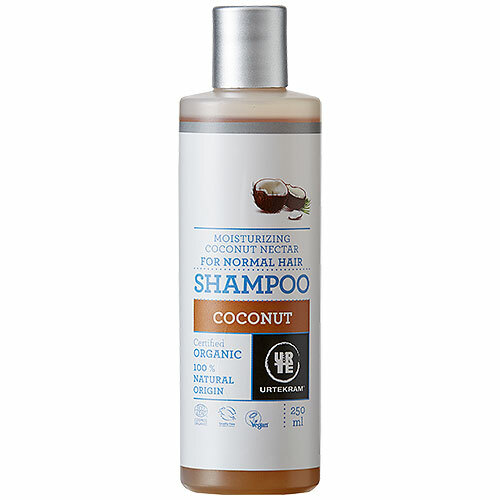 Urtekram Coconut Shampoo with organic coconut nectar and daisy flower extract naturally helps to moisturise while seaweed extract revitalise the hair. Aditionally it leaves your hair with a wonderful scent of natural coconut sweetness. Aqua, cocos nucifera saccharum extract*, sodium coco sulfate, coco glucoside, ale vera barbadensis extract*, lauryl glucoside, parfum, citrus aurantium dulcis peel oil*, laminara digita extract*, glyceryl oleate, sodium chloride, polyglyceryl-4 caprate, xanthan gum, bellis perennis flower extract, magnolia bark extract, tocopherol, beta-sitosterol, squalene, limonene. * = Organic farming. ** = Made using organic ingredients. Below are reviews of Urtekram Coconut Shampoo Organic - 250ml by bodykind customers. If you have tried this product we'd love to hear what you think so please leave a review. Urtekram Coconut Shampoo with organic coconut nectar and daisy flower extract naturally helps to moisturise while seaweed extract revitalise the hair. 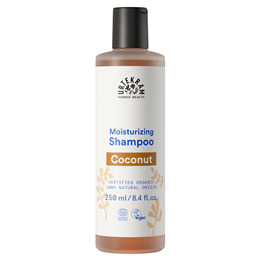 Additonally it leaves your hair with a wonderful scent of natural coconut sweetness.